This was my sixth year attending Miami Swim Week and it’s safe to say this is still my favorite event of the year. (Yes, it even tops NYFW for me, but more on that below.) 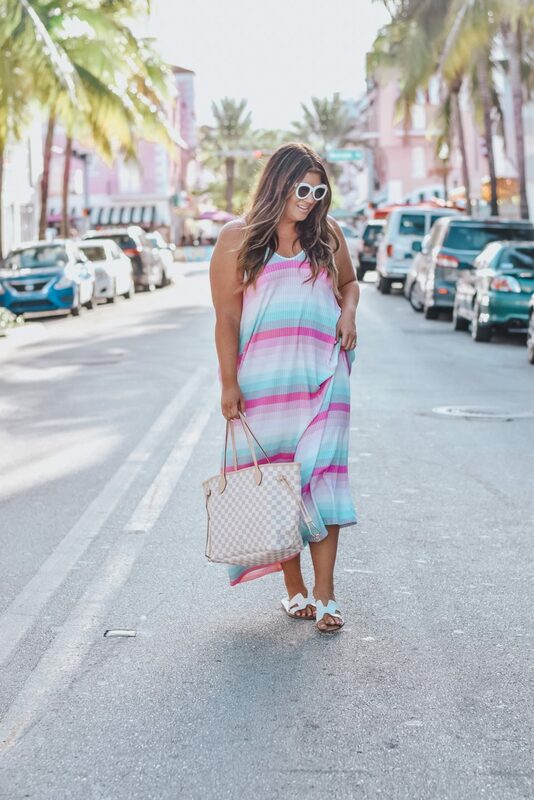 I love everything about the Miami vibe and I feel right at home in a hot, humid and beachy locale like South Beach. So what’s it all about and why do I go? Let me take you through the fun, day by day. 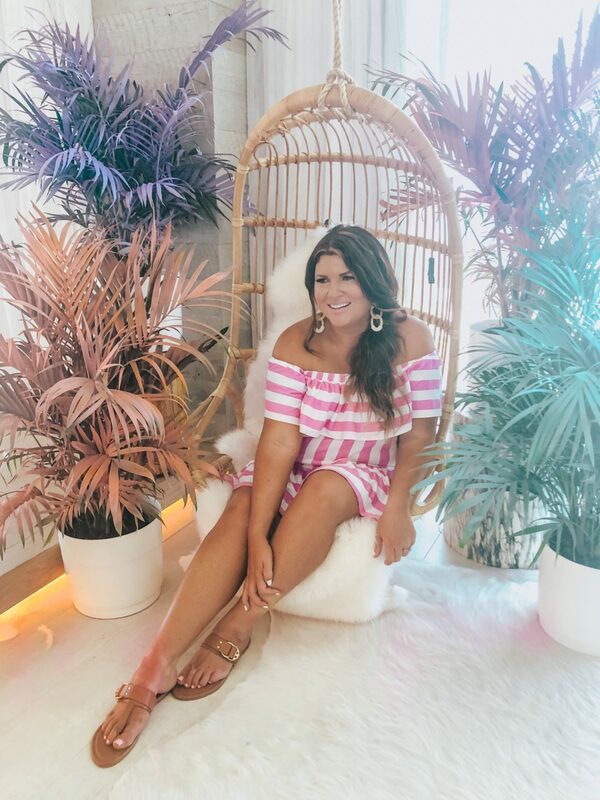 As a blogger living in a small town with the closest metro area still 4 hours away, connecting with brands and the PR agencies that represent them in person can be tough. Making connections and having face to face chats or meetings can go a long way in staying top of mind and maintaining relationships. I think of Swim Week like a conference, where I’m going to learn, network and get inspired. 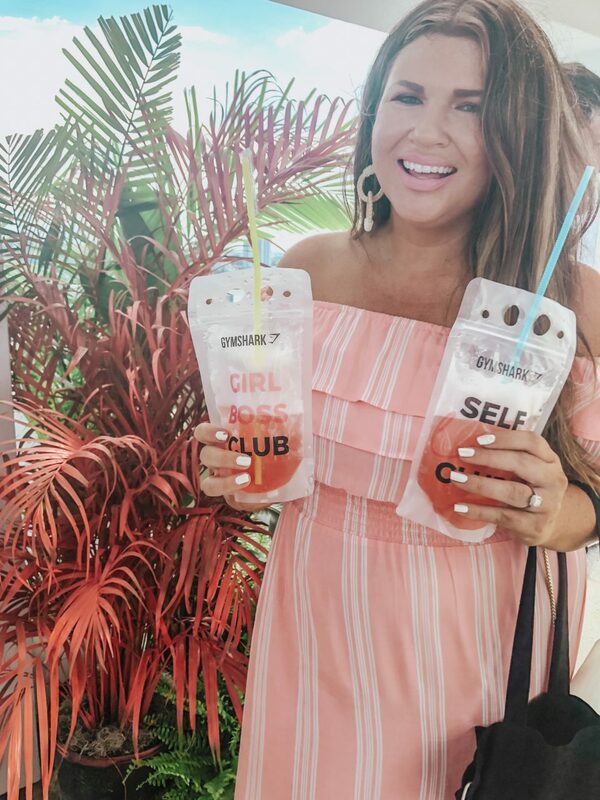 It’s amazing how many more influencer-brand events and activities happen on a daily basis in cities like New York or LA that we simply don’t have easy access to thanks to being in our little bubble of 30A. (It’s both a blessing and a challenge.) This is also why I love attending NYFW, because it’s a rare chance to stop in different offices, connect on a more personal level and get to know my brand/PR friends without the distance. 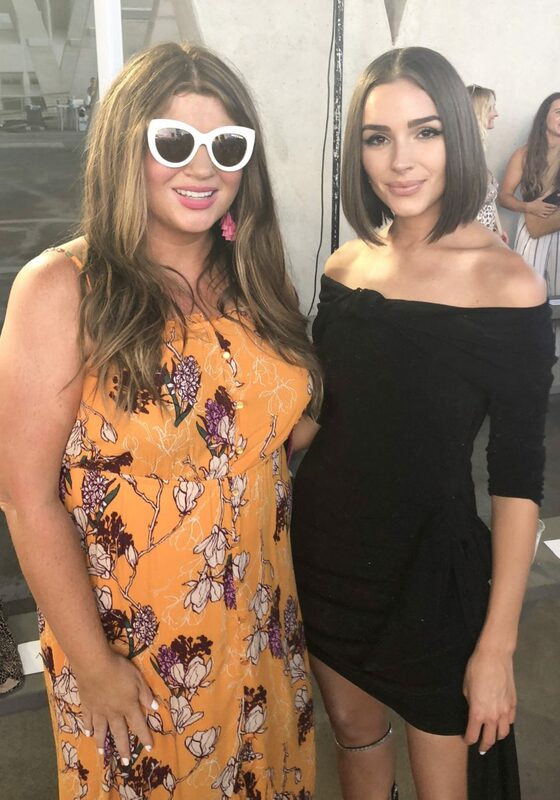 I find so much more value in the branded events than the runway shows for this reason, but the shows are always so entertaining and fun to watch. 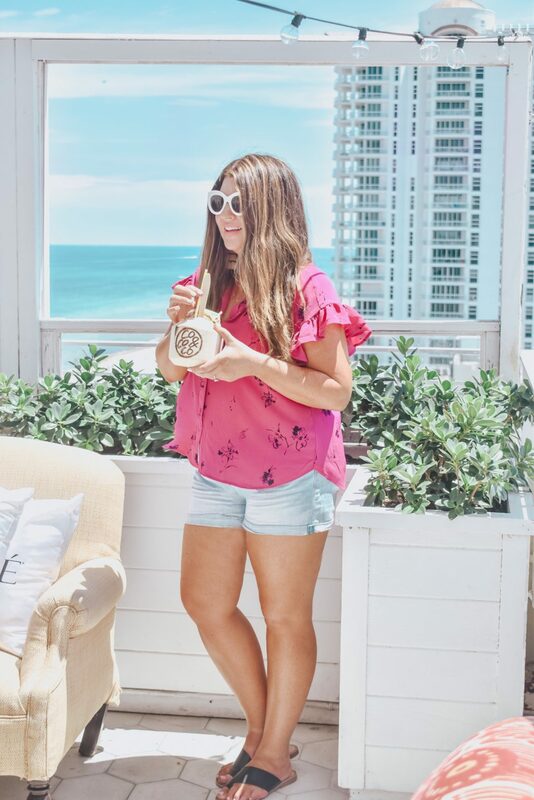 With all that said, (and keeping in mind my love for the Big Apple) Miami is much more my vibe than New York, simply because the beachy lifestyle is more relatable for a Florida girl like me and even though we have packed schedules, the atmosphere is noticeably laid-back and relaxed as far as fashion weeks go. If you’re a blogger and you’ve never been, it’s worth the trip to experience it at least once. This year my girlfriends and I opted to make our Miami home away from home a little further south in true South Beach. 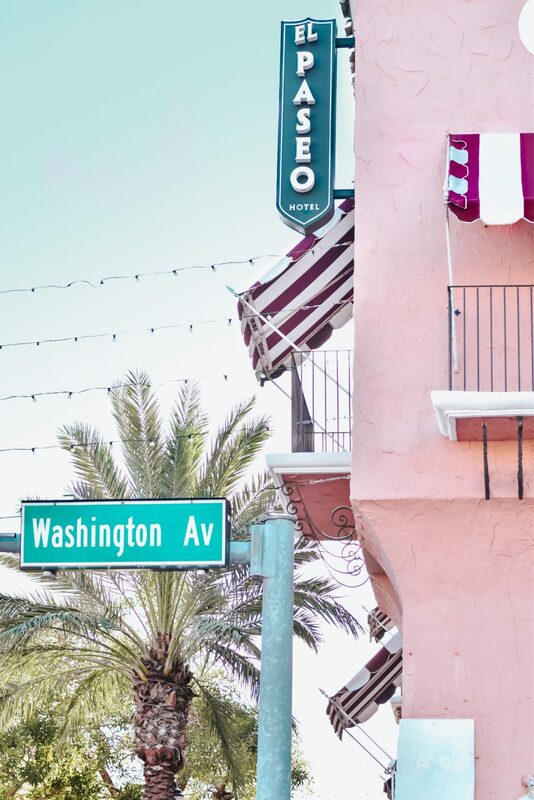 Our hotel, El Paseo, is an adorable three-story boutique hotel located on Washington and Española Way (just one block west of Collins Avenue and 3 short blocks from the beach). The entire area is lively day to night and Española Way is actually closed to cars making it a cute, walkable stretch lined with restaurants and shops. Each place spills out onto the street, so it really feels fun and hospitable, though one day we were there, the World Cup was on and they had a huge big screen set up in the street, making the atmosphere feel almost electric. It was so neat to see! We arrived late Wednesday evening and after flight delays and one lost bag, we finally made it to South Beach to settle in for the night. We went to sleep around 1 AM and I don’t think I’ve ever slept so well. This mama was tired already! 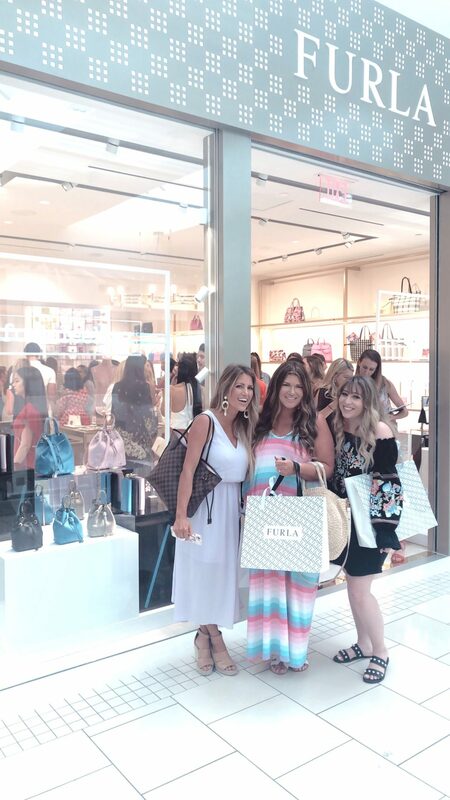 On Thursday morning, we woke up after not nearly enough sleep to make the first stop of the day, a pop-in breakfast at the Furla store at Aventura Mall. (I should note regarding our hotel location that this was our longest Uber ride, other than to and from the airport, just because the mall is out of the way. I think everything else was $6-$10.) 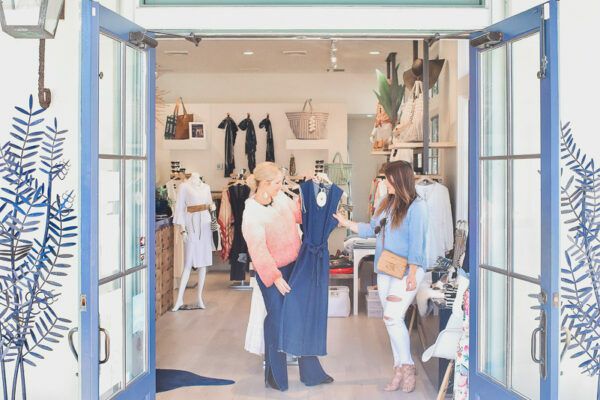 The store was buzzing with activity and we heard from the president of the company while downing a green juice and chatting with a few blogger friends. From there we headed to Nordstrom since we don’t have one in our area and it was the first day of the annual Nordstrom Anniversary Sale (serious blogger business!) Meanwhile, Hunter had a general idea of our schedule and texted me to stop in Louis Vuitton while I was at the mall. I was immediately suspicious and excited! I asked for the salesperson whose name he gave me and sure enough, my sweet Hunter Ray had arranged a surprise LV Neverfull ready for me to pick up. Now that’s romance – ha!! 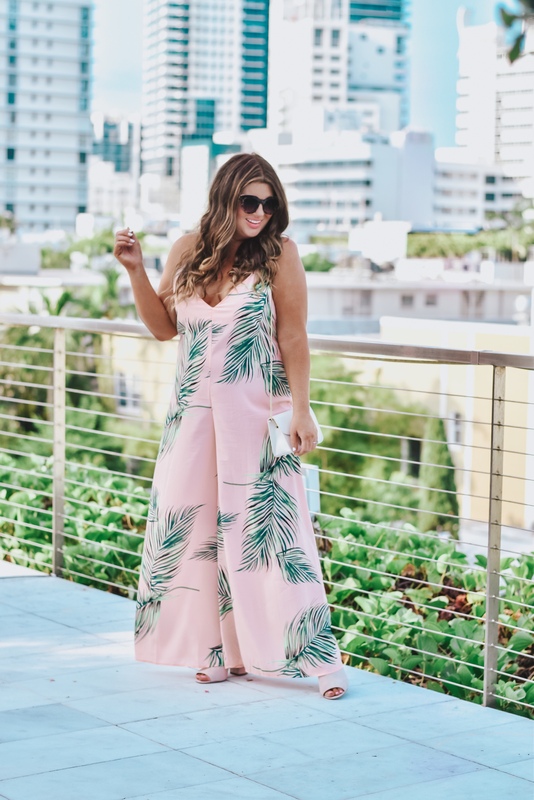 You can see all of my Nordstrom shopping on this post I did during Early Access. We made it back to El Paseo in time to wander the neighborhood with music playing through the streets. This pre-sunset time of day was one of my favorites On Española Way! We cooled down and headed to an event at The Standard, which is one of the cutest hotels in the area. 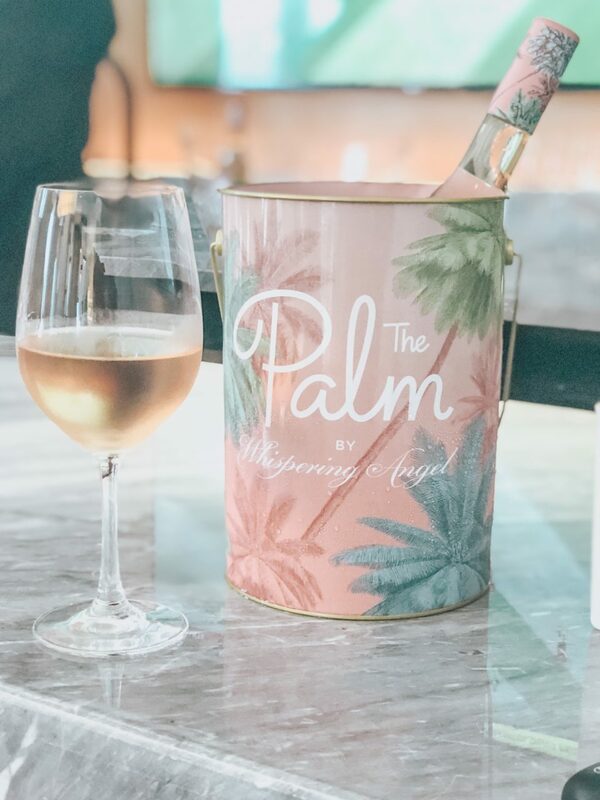 Everything is lush, chic and totally Instagram-worthy. 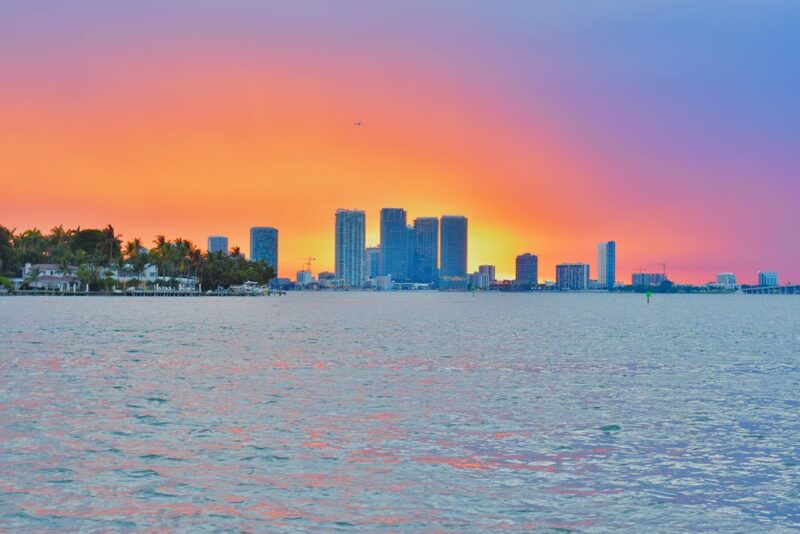 It’s located on Belle Isle on the Venetian Islands and has one of the most beautiful sunset views in Miami thanks to its westward view. (Most of the South Beach hotels’ sunsets are behind the hotel, not over the water like on 30A.) My lemon print set perfectly coordinated with The Standard’s yellow splashes on the pool deck. From there we hopped over to the Paraiso tent where the runway shows were all taking place this year. 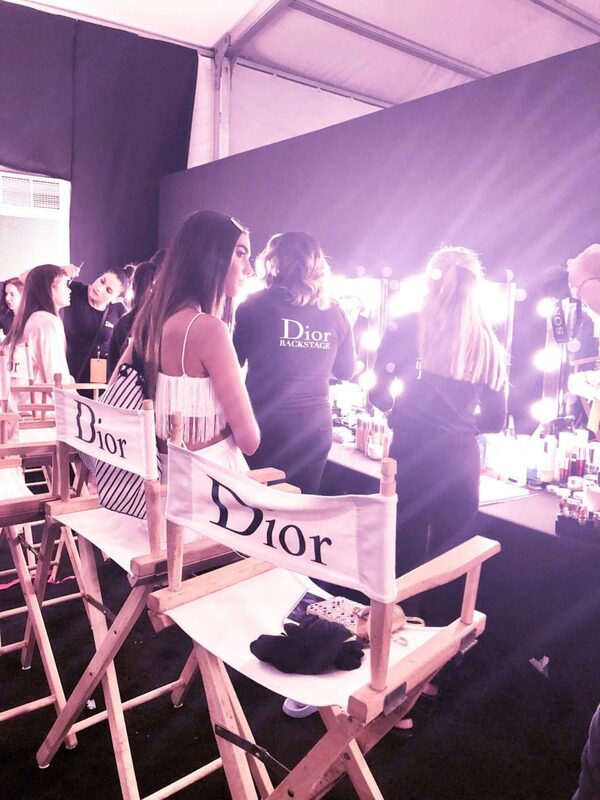 We went backstage for Baes and Bikinis to get a sneak peek of hair, makeup and swimsuits before the show. I love the energy backstage and seeing all the efforts of each person involved rushing to work in that air of organized chaos. On our way back to the hotel, we spotted a mouth-watering window scene from the sidewalk: fresh pasta being made right in front of us. We had already decided to Uber Eats dinner to the room and we immediately changed our minds. 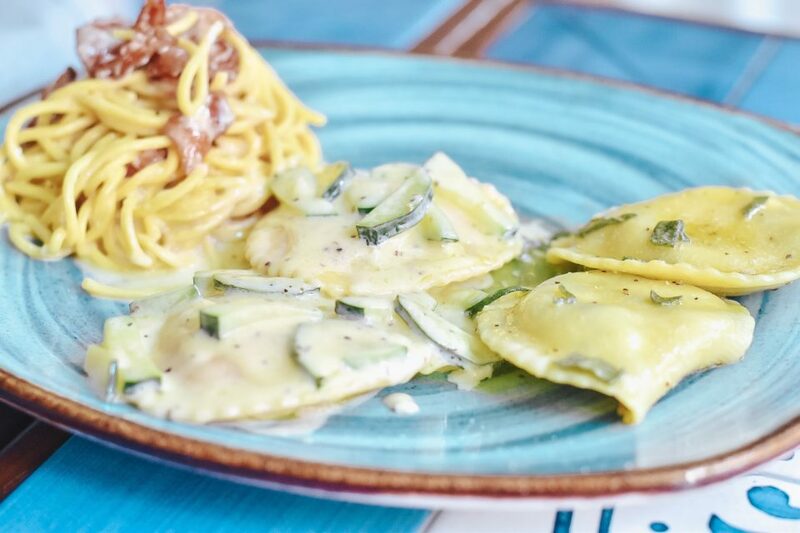 Our meal at Pane y Vino was a quaint little gem, beyond delicious and not only did I down my entire lasagna, but I also couldn’t get enough of the oil and vinegar dip. I highly recommend this spot! After we were primped and ready to go, we attended the most adorable brunch hosted by my friend Kristin Chambless (Color by K) and Amanda (Fashionable Hostess). 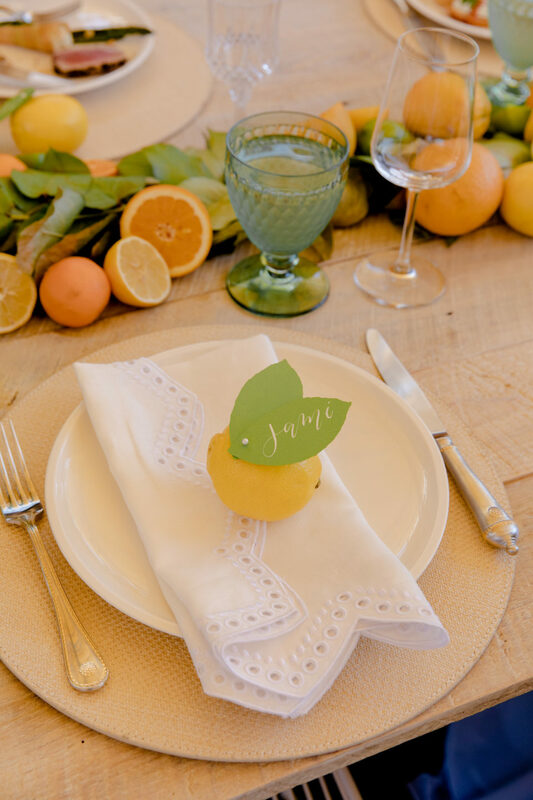 The citrus theme was speaking to me 100% and I couldn’t get enough of the beautiful home (owned by Amanda’s uncle) where the event was held. 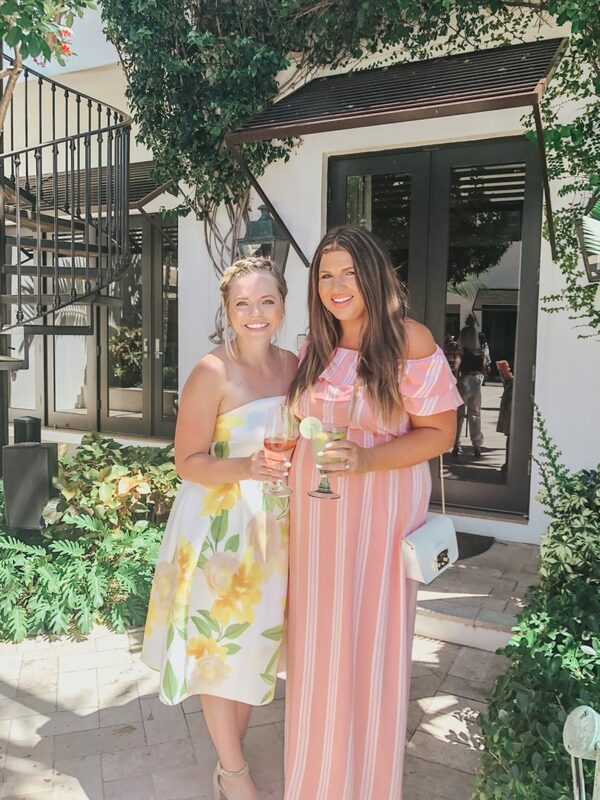 Every bite of food was delicious and every detail was so thoughtful, from the place cards to the gifting suite to the bar selections and beyond. It was honestly on par with brand events I’ve attended and I can’t resist sharing a few extra pics from the morning. 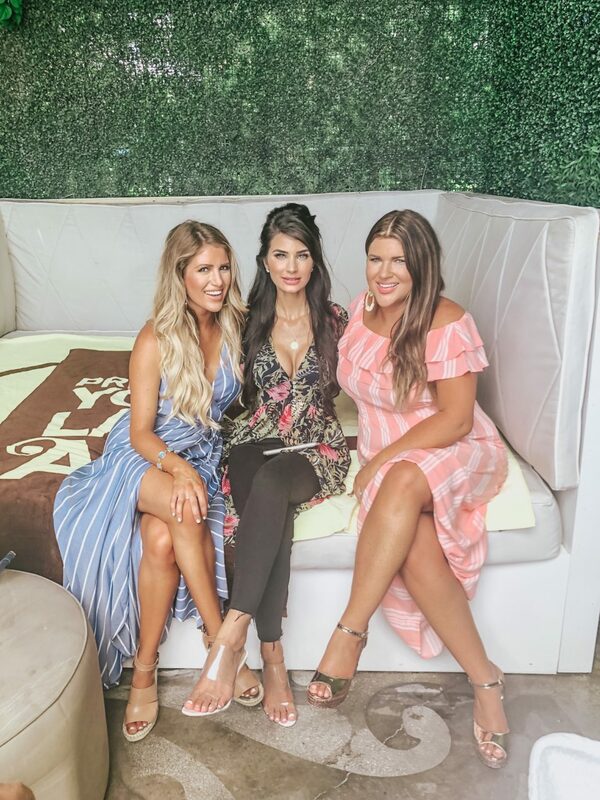 Next we stopped by to see our friends with Sun Bum at the Mondrian, where it felt like 1000 degrees and I was immediately sorry I hadn’t brought my swimsuit. From there we popped up to the penthouse at The Nautilus for a Gym Shark party. 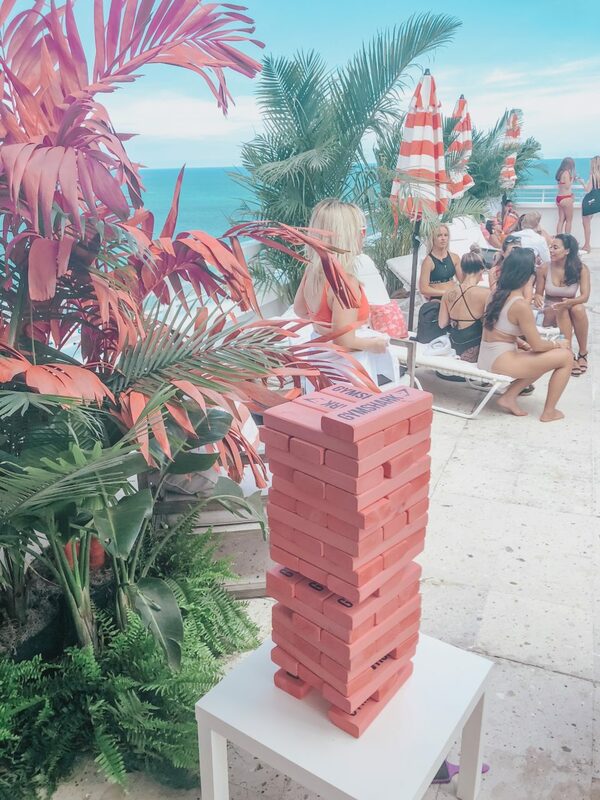 I immediately loved the giant pink Jenga, the painted palm fronds and the rosé served like adult Capri Suns. I also spotted Vanesa Seco doing her dance thing, which I have to say is pretty amazing in person. After a refresh back at El Paseo (where a nap may or may not have been involved), we headed out for the evening. 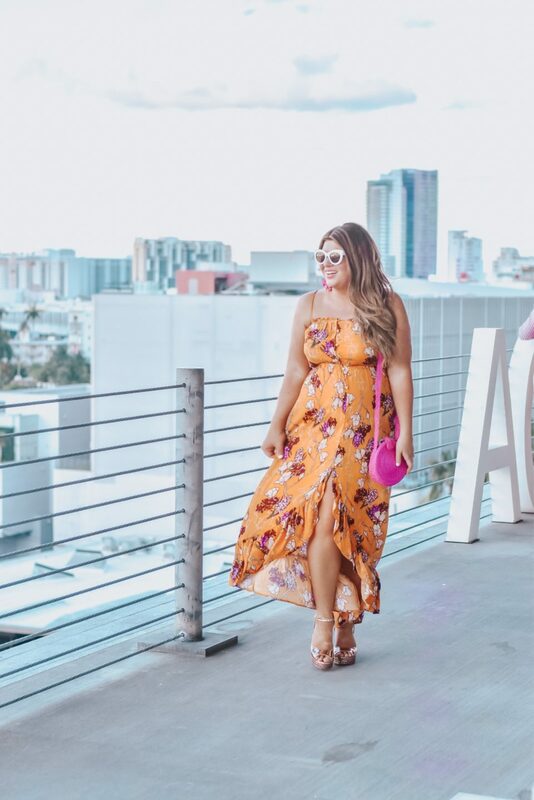 We completely missed the Monday Swimwear show (accidently) and started with rooftop views at a Freebella and Melissa event. Strawberry sorbet made on-site tasted like a dream. 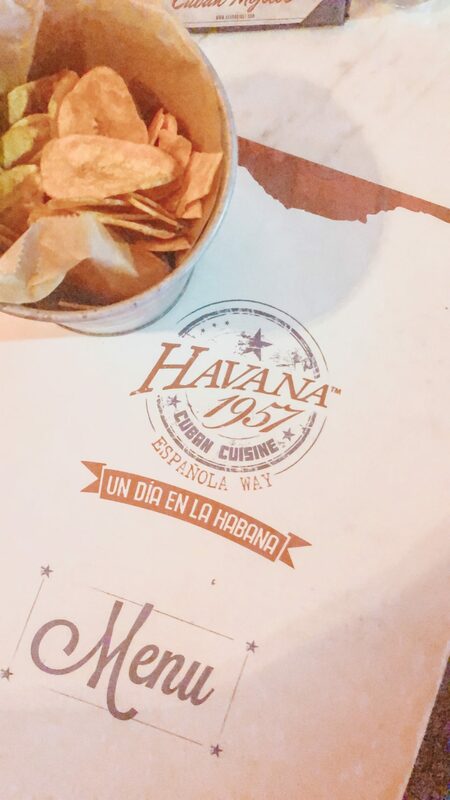 followed by dinner at El Paseo‘s downstairs restaurant Havana 1957, a tasty Cuban spot. Saturday morning was a whirlwind of PR visits. 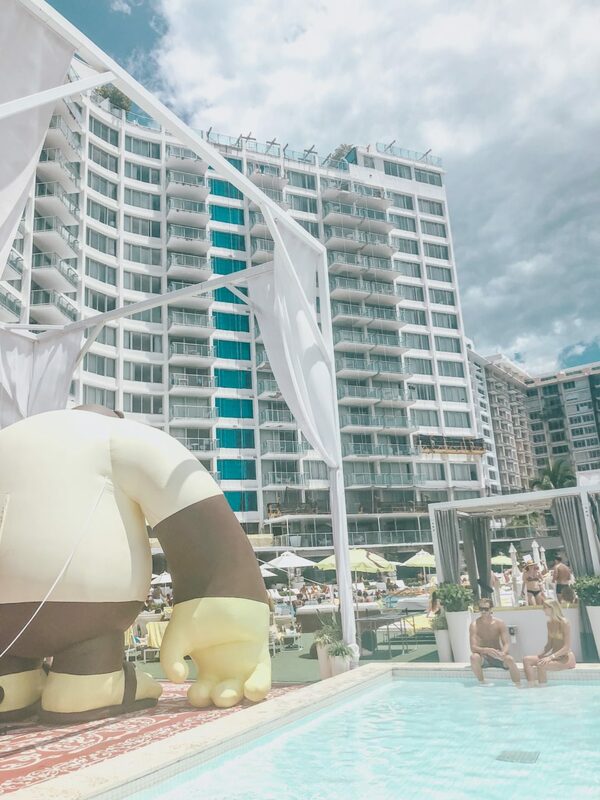 We started with our friends at The Riviere Agency, who were settled into the penthouse of the Boulan Hotel for a Swim Week Speakeasy with lunch and brand activations. The bright girly shades of Nessy Swimwear caught my eye immediately! 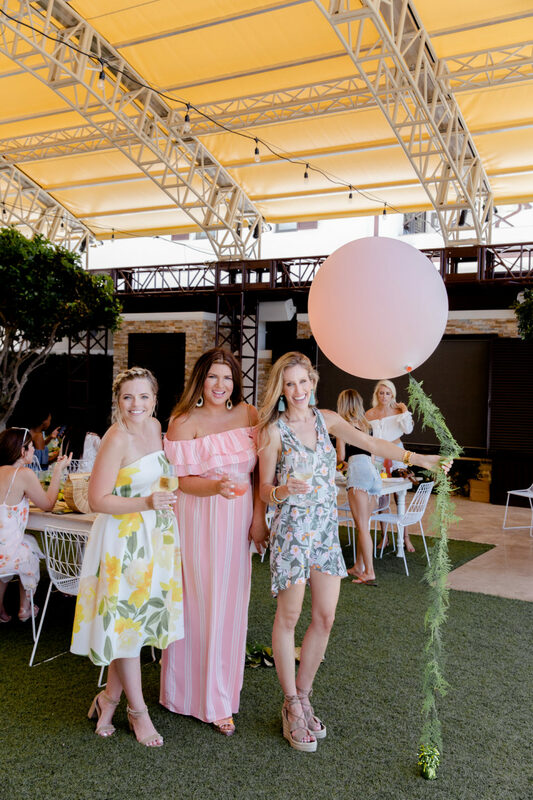 Next up, we visited Tractenberg & Co‘s Studio Event at The Nautilus with so many fun brands onsite. Since I don’t currently have eyelash extensions, I opted for a set of lashes (much needed!) and browsed and snacked my way through the event. I love seeing how brands come to life and this was a great example. Our final afternoon stop of the day was at 1 Hotel South Beach, which is probably in my top 3 Miami hotels. Bollare always hosts a chic suite and I can always find myself taking mental notes of decor and styling details. Not to mention, the brands they rep are fabulous! The evening festivities kick-started with dinner at Oh Mexico on Española Way, which was exactly 100 steps from my hotel bed. No Uber required! Next was an incredible runway show by Acacia on an open level of a parking garage off Lincoln Road. I loved so many of their looks and adored the little girls in the show. Also, my friend Sam spotted Olivia Culpo sitting down from us and I have to tell you, in person she is flawless. Wasn’t Nick Jonas’ song “Jealous” written about her? We then went back to the Paraiso tent for back-to-back of shows Luli Fama and Sinesia Karol. Our final event of the evening was Kaohs at The Setai. On our last day, we woke up to try to beat the heat and shoot swim. 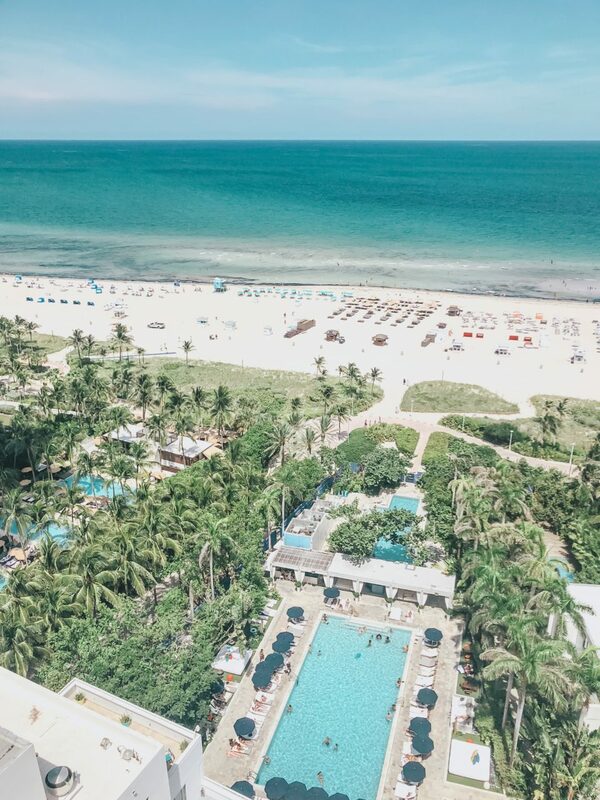 In Miami, there is no beating the heat! 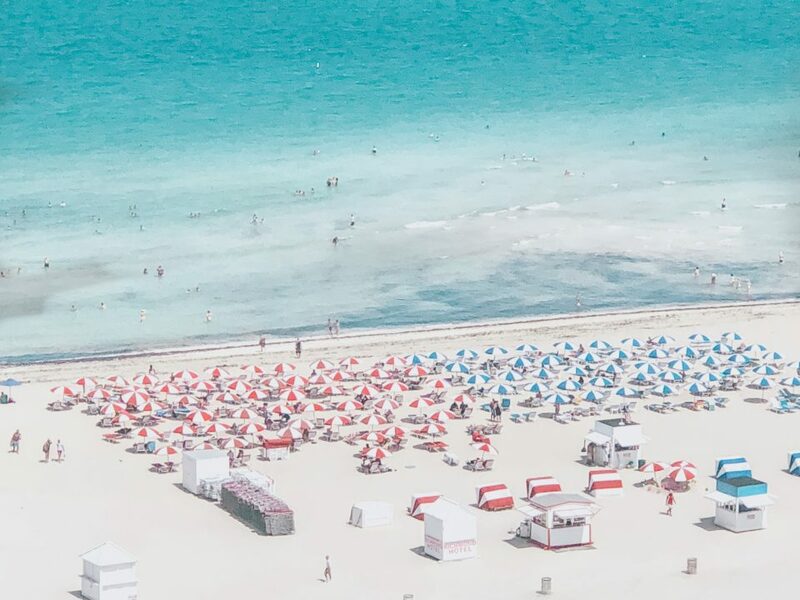 It’s 100% hot and humid, but I love the lifeguard towers, the chair and umbrella setups and the colorful backdrops of South Beach. It’s just a fun change from our beaches. We knew the rest of the day’s events would be go-go-go followed by rushing to the airport to catch our flights so we went pretty casual. 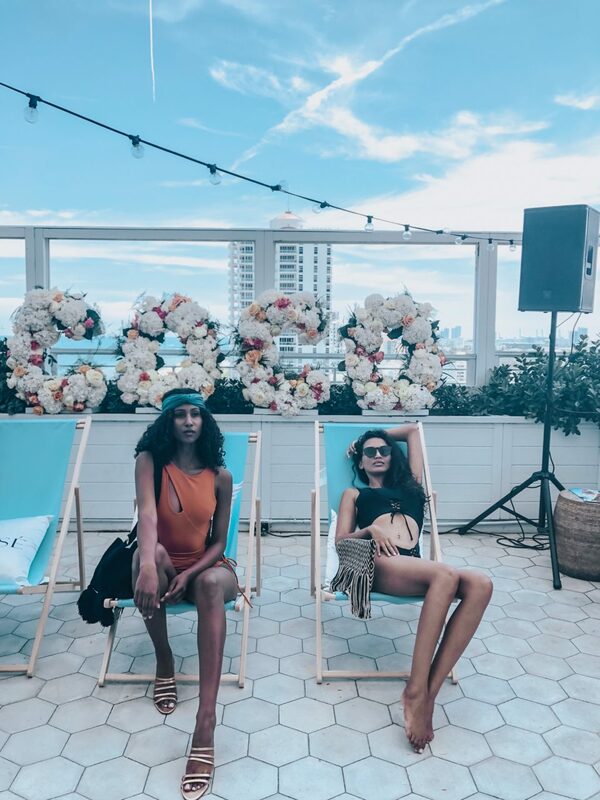 We started at the Bikini.com x Bollare brunch at Soho Beach House. stopped by the Net-a-Porter and TAJA Candle suite at Nobu Hotel. Our final stop of the trip before departing MIA was an incredible dinner at Piccola Cucina near El Paseo on Española Way. 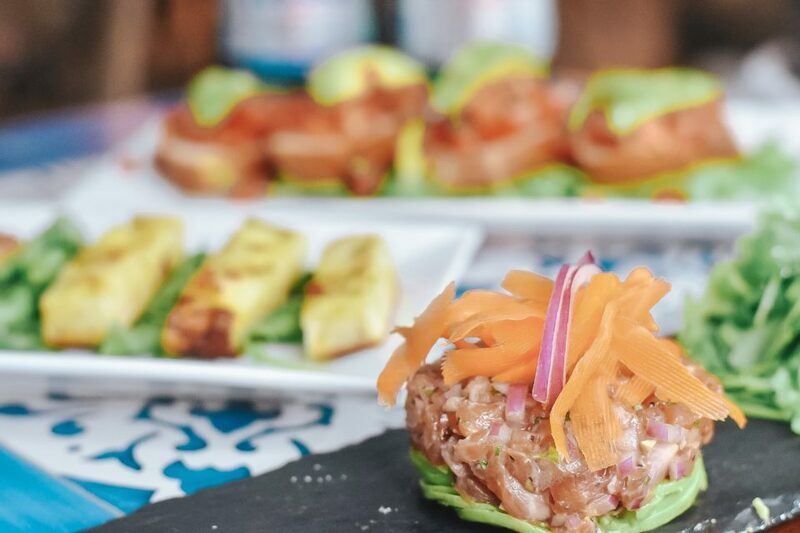 I immediately connected with Jackie, the chef + proprietor who shared how she recently switched gears to follow her dream as a chef. Her family also works in the restaurant and I loved how dining there felt like we were sharing a meal with friends in their home. Everything was carefully prepared and we were enjoyed an array of samples that I think I could eat every day without getting tired of. This was my favorite meal of the trip and I highly recommend stopping in. Please tell them I sent you!